Tired of hiding your smile? Are you constantly placing your hand in front of your mouth, so people won't see your smile? Break Free - With Invisalign! The Invisalign process is a simple way to restore your smile to perfection. - How Does Invisalign Work? An impression is taken of your existing teeth. This is sent to the Invisalign company, where the impression is computerized via a CT scanning. Once digitalized, your teeth appear as a picture on a computer. Your doctor at ProDent NY will then give precise instructions to the Invisalign company, telling them how your teeth should move. Once the design is approved by the patient and doctor, a series of aligners are made to custom fit your teeth. Each aligner is slightly different than the next, so that your teeth will gradually move into the desired positions. On average, most people notice a significant difference as soon as 6 months! 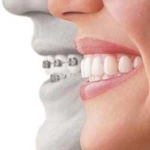 - What are the advantages of Invisalign over traditional braces? There are many advantages to Invisalign! The major advantage is that they are virtually invisible! No one can tell that you are wearing them. No need for metal wires and brackets that are unsightly! In addition, they are 100% removable. If you have a big event, simply take them out! Finally, they are much less painful than traditional braces. - Are there any disadvantages of Invisalign? No! Once your doctor states that you are a candidate for Invisalign, you can simply sit back and relax, knowing that your teeth are being straightened -- Invisibly!